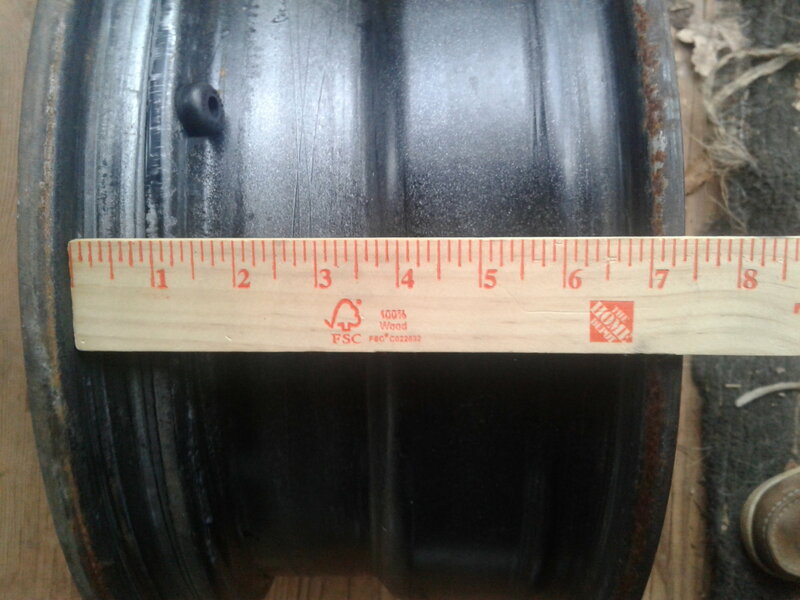 Stock tire size equivalent for '74 Vette. I believe that 225/70R15 tires will be close to stock. 27.4” diameter, 8.9” width. How's the bump steer on tires that large on a car that wasn't "designed" for them? How's the steering and rapid handling? What's the tire height? I notice the a whole lot of C3 Vettes have a ton of air between the top of the tire and the fender lip, looks awkward as Hell to me, almost "off road" and something to avoid. Maybe the 255s will eliminate that "problem." Thanks, TC. 255/60-15's on the front (and back was stock) and 275/60-15's on the back. Fills the wheel wells perfectly on my 74. The "section width" is about 9 inches +/-. That's measured at the widest point on the tire. The tread width varies depending on manufacturer and specific tire model you're looking at. For 225/70R15 tires, you can find them from 6 inches tread width to about 7 inches tread width. Performance tires generally have wider tread, "energy saving" tires, generally have narrower tread. Last edited by C6_Racer_X; 11-07-2018 at 09:07 AM. "Fills the wheel wells perfectly on my 74." That's a MASSIVE amount of air between the top of the tire and the edge of the wheel well lip, looks like well over four inches. This "off road" look is something that I'm trying to avoid. Possibly the fault isn't in the tire choice but rather the spring height or settings. I'm hoping to be able to have the front and rear spacing match up. Anyone solve this? Anyone have the same spacing between tire top and fender lip match up front and rear? Thanks, TC. How's the steering and rapid handling? What's the tire height? . I drive very aggressive and my car handles real well in the curvey TX Hill country roads in my area. Overall tire height is 26.25" and there is slightly less than 2" gap above tire to fender. That's a MASSIVE amount of air between the top of the tire and the edge of the wheel well lip, looks like well over four inches. Agreed! His rear suspension does not look stock. 74Ken - do you have air shocks?! Thanks Steve-o ! Great to hear and I really do love the stance that you've achieved on your ride, exactly what I'm hoping for. I honestly don't know. why my back end is up, it was like that when I got it. There are no air shocks there, maybe the spring. But I'll let you in on a little secret...I LOVE IT THAT WAY. In my opinion, most stock cars look like they are going up hill all the time. Last edited by 74Ken; 11-07-2018 at 11:46 AM. To me, it looks like someone "fully tightened" the end link bolts on the rear leaf spring ends. That happens when someone replaces the leaf spring or the endlinks and doesn't understand the function of the endlink bolts. Always measure or count threads and only tighten those bolts to match exactly where they were whey you started. If you like it where it is now, you can keep it that way. It looks way too high to me, though. It won't handle as well jacked up like that, and it's very likely you've got weight jacked into the chassis. If you're going to change the ride height on these cars, it's a good idea to get a set of four scales and set the corner weights to keep the handling balanced. If you've got weight jacked into it, it will favor turning in one direction over the other, and it can even pull to one side. I'll second the 225 recommendation previously - it's the dimensional equivalent to the original GR70s. 255s were in fact an OEM size by 1978 and I'm not aware of any suspension "design" changes to accommodate this size on later C3s (maybe the factory trimmed the fiberglass differently on the front fenders?). However 255s can sometimes rub the front inner fenders especially if bouncing while turning sharply. 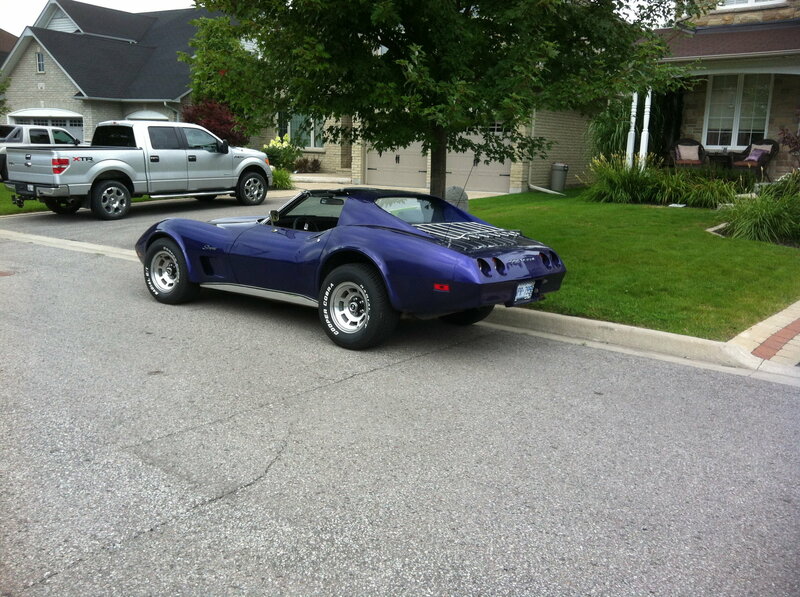 Some like them on earlier C3s (aesthetically they fill up the fenders nicely). A few have reported problems with rubbing or so I've heard. AFAIK there are NO performance tires left in any of these sizes - so it comes down to looks I suppose. Excessive height in front can be due to new/incorrect springs. Rear excessive height can be adjusted in some cases. One more comment, and another variable to add to the mix. Check the width of your wheels. Some C3's had 8 inch wide (15x8) wheels, and I don't know of a 225/70R15 that is recommended (or safe) to mount on a wheel that wide. Check the manufacturer's spec sheets for your tires. Most 225/70R15's are specified for 6" to 7.5" wheels, and they look and drive great on 15x7 wheels that are the most common for C3 Corvettes. If you have the optional 15x8 wheels, the 255/60R15 tires are the best choice, and about the only choice that fits properly on those wheels. My wheels measure nine inches from edge to edge although I maybe ought to be measuring them in a different spot. 15X7 rally wheels were standard equipment on 68 Corvettes and beginning with the 69 model year 15X8 rally wheels became the standard size for C3’s. Starting some time in the 1970's, wheels were required to be marked with the size. The size designation will be something like 7Jx15H ET0. The first number is the width, the number after the "x" is the diameter. The number after the ET is the offset in millimeters. The wheel in my picture is 7 inches wide. Thank you for that measuring guide as to where the ruler/tape needs to be placed, I was measuring from the outside edge of the rim side to side. I'll check tomorrow (too dark to poke around in the yard right now) and see what I actually bought.
" . . . beginning with the 69 model year 15X8 rally wheels became the standard size for C3’s." Did the stock tire size increase to the equivalent of 225/70R15 at the same time? Did the stock tires rub inside of the wheel wells on turns/while bouncing/etc. as suggested or is it a radial vs bias ply thing happening now? As the car is just a street car, I wouldn't mind running bias ply tires at all if they fit better than radials. Quick Reply: Stock tire size equivalent for '74 Vette.